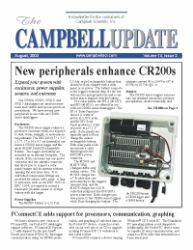 Campbell Scientific's CSAT3 sonic anemometer has established itself as a leader in high-fidelity turbulence measurements. However, the CSAT3's performance was compromised in wet/rainy conditions. An upgrade to improve performance in the rain is now available. It is comprised of three changes: a surface coating on the transducers, updated embedded code, and a revised factory calibration procedure. The rain upgrade maintains the CSAT3's current wind accuracy, wind resolution, and speed-of-sound accuracy. Although the rain upgrade reduces the CSAT3's speed-of-sound resolution from the previous version, the resolution is still a factor of 10 better than the CSAT3's closest competitor. The new speed-of-sound resolution for 10 Hz, over-sampled measurements is now 0.007 m-2, or about 0.012°C on sonic temperature. It typically adds a random uncertainty to 10 Hz, 15-minute sonic sensible heat fluxes of less than 0.5 W m-2. The CSAT3 rain upgrade can be retrofitted to existing anemometers. Contact an applications engineer to upgrade your CSAT3.